WHAT IS A FLIP QUEST? You may be familiar with the concept. Think, the red paperclip story. A guy finds one, trades it for something better, and keeps doing this over & over until he gets a house. I coined the term “Flip Quest” (at least I think I did!) but not the idea. Back in 2013, I did it by flipping a 1989 Fleer set I was gifted over and over until I got a 1999 Topps Traded Josh Hamilton auto. Trust me, back then, there was a large price discrepancy! 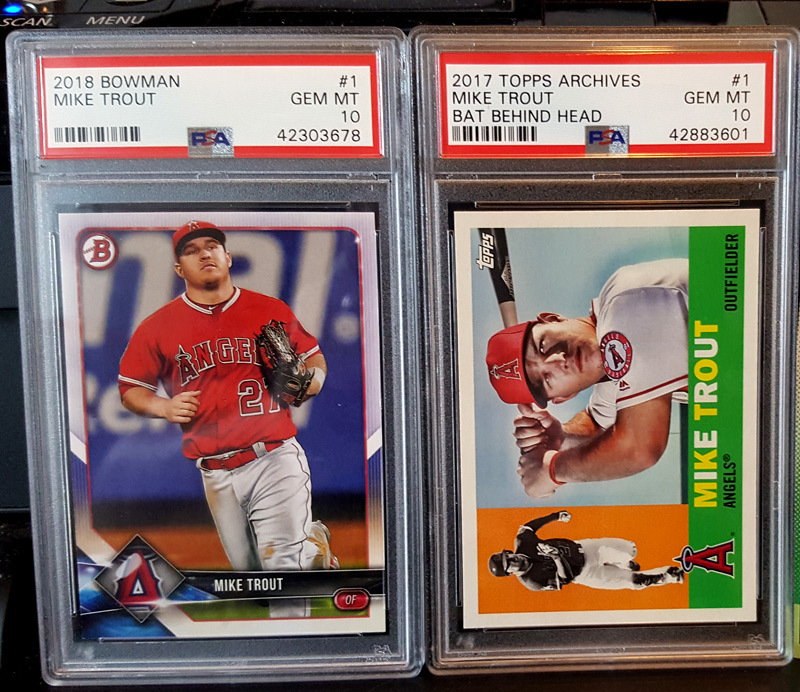 I received both of these as a gift due to a Trout acquisition I made, so I think these will be PERFECT to start off with! Here is what I would eventually like to trade up to. I don’t have an *exact* goal other than I’d like to get one, several, or all of the following! The vintage items that say “low graded” mean that I want a lower grade, but great eye appeal. So, let the game begin! I’ll start documenting the trades I make here. Feel free to shoot me trade offers! 4/10/19 – Things are moving right along! I just traded away the 2018 Bowman Mike Trout PSA 10 for a 2017 Topps Aaron Judge RC BGS 9.5 – Incoming and available!